In a busy market like we have in some price ranges now, there may be things some buyers will overlook simply because there are less homes to choose from. 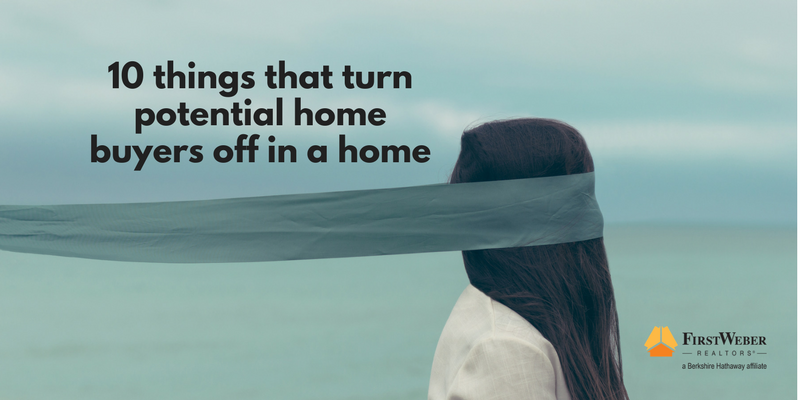 But for higher end properties, or in a buyer’s market, these 10 things are sure to turn off potential buyers… so address them before putting your home on the market. Great article here for sellers. Dark homes with poor lighting. You want light, bright and inviting. Your pets. While you certainly love them, some people are allergic and others may be frightened. Lastly… You. Leave the showings to your Realtor and enable people to look at your place comfortably and at their own pace. Those are all things you have control over so prepare and plan to make the best impression on those buyers walking through your home. For more advice on selling your home, please talk with one of our Wisconsin real estate agents. With 50 real estate offices in Wisconsin and 1500 agents, you’ll find a location near you and an agent that you click with. Find a First Weber real estate agent or a First Weber real estate office here..